While almost anything in your home can require special care when you're moving, your plants are perhaps at the top of that list. Because they are living things, plants can be especially difficult to relocate. Even if you do get your plants successfully to your new home, getting them to adjust and thrive can be another challenge. Upon arriving at your new home, carefully remove the plants from their boxes. 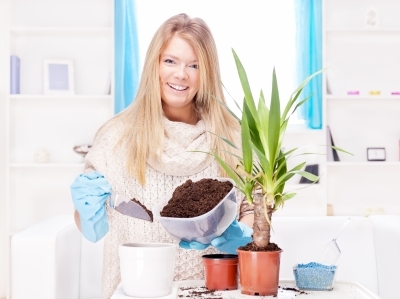 Inspect the plants for any damages that may have occurred during the move. For instance, if a branch or leaf happened to snap off, be sure to remove it. You can then place the plants in locations with plenty of light and air. If you transferred your plants to plastic pots (to avoid damage to your decorative ceramic pots), you might want to hold off on retransferring them back. Since your new home is likely to have different levels of sun, humidity, and air quality, it is a good idea to let the plants adjust first. Trying to replant them into different pots can cause a lot of stress as they get adjusted to their new surroundings. If, after a few days, they seem to be doing fine, then you can put them back into their original pots. Your new home may have a different soil composition than your old home. If the difference is too extreme, the plants won't survive. The amount of rain a particular area gets can negatively affect a plant, depending on whether there is more or less precipitation than at your old home. Your new location might have varying levels of sunlight and different temperatures from what your plants were accustomed to. TIP: Do some research to find out which of your plants will have a hard time adapting to different conditions before moving them. If your plants are still having trouble getting adjusted to your new home, try moving them around to different spots within your home. The lighting they receive can make a huge difference in how they adapt; too much or too little light can cause them to die. If your plant appears to be wilting during the day and its leaves get brown spots or completely dry out and fall off, it is probably getting more light than it needs. On the other hand, your plant might be showing signs that it's getting insufficient light if it is growing slowly or not at all, new leaves appear smaller than older ones, or leaves are turning yellow. If you determine that your plant is getting either too much or too little light, try rotating the pot or putting the plant in different parts of your home. Also, your plant may need either more or less water than what you would normally give it. Too much water can cause the roots of the plant to rot or stunt its growth. If the plant doesn't get enough water, then its leaves may turn brown and dry out. Adjust the amount of water you give them accordingly. There is no question about a plant's ability to brighten up a living space. By bringing your favorite plants from your old home to your new one, you can spruce up your home with a familiar touch. Just make sure you give them the proper care, and your plants will likely thrive in your new home. The Unpacking Order: What Should You Unpack First? When Should You Connect and Transfer Your Utilities When Moving?